Capriko is an award-winning, semi-hard cheese made from a blend of fresh goat and cow milks. This handcrafting blending of milks, showcases the cheesemaker’s art and delivers a cheese that is firm, yet has a creamy mouth feel and a sweet, nutty flavor, followed by a pleasant tanginess. Capriko is a great eating cheese, just add a glass of wine and its creaminess makes it an excellent melting cheese as well. 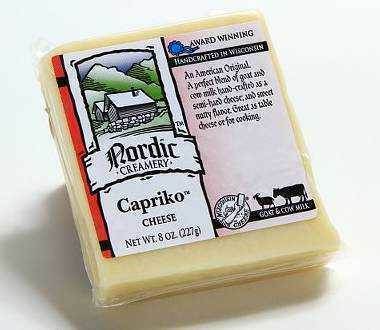 Capriko is such an original cheese that it has its own listing in the Cheesecyclopedia. Dan at the Wine Guyz Recomends: How about a crisp, lightly oaked Chardonnay? William Hill Chardonnay would be perfect with this fantastic blended cheese. This cheese is very good. The nutty taste makes it delicious!! Service Area: Westby, Onalaska, Tomah, Richland Center, Holmen, West Salem, Milwaukee, Stevens Point, Rhinelander, Waukesha, Wisconsin Rapids and surrounding communities.